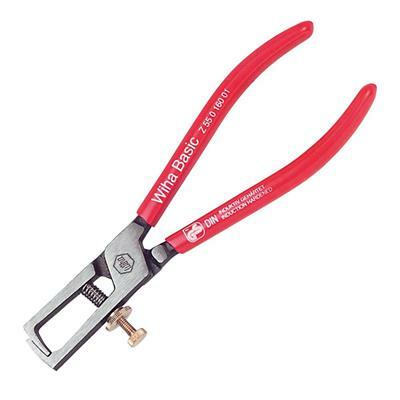 Wiha 32645 stripping pliers, 6.3-inch OAL. DIN ISO 5744. Heavy duty forged with induction hardened cutting edges for even stipping of insulation. Easy to use adjusting screw allows the stripping diameter to be set. Opening spring for effortless and sensitive handling of pliers. CV special tool steel. For stripping up to 5mm/#4 AWG conductor cross section. Soft vinyl grips.